A splendid teamwork and a perfect lead-out helped the Colombian become the youngest rider in the last 13 years to win multiple stages at the race. 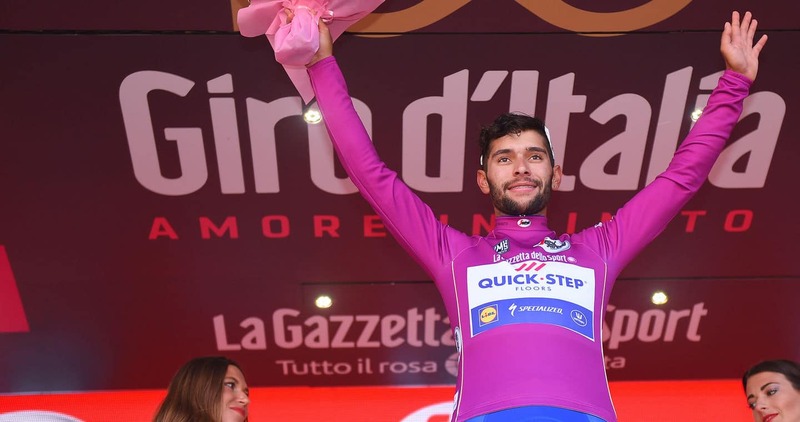 Fernando Gaviria became only the second rider this century to win multiple stages at the Giro d’Italia before turning 23. It happened Wednesday afternoon, in Messina, which was visited by the race for the first time since 1999, and it was a success that came following a sublime ride of the entire Quick-Step Floors team, who moved to the head of proceedings from the start of the stage, in Pedara, controlling the escapees’ advantage and bringing them back with 15 kilometers remaining, before guiding the Colombian to another memorable win, the squad’s 26th of the season. Before it all came down to the expected bunch gallop, Fernando Gaviria scored valuable points at the day’s both intermediate sprints, behind the two breakaway riders, moving into the virtual lead of the ciclamino rankings. Once things heated up right before the sprint, Quick-Step Floors remained focused and attentive, coming to the front inside the final kilometer, thanks to a mammoth effort of Grand Tour rookie Davide Martinelli, who upped the pace at the right moment, opening the way for Maximiliano Richeze and Gaviria. The Argentinean’s huge experience, calm and tactical nous proved crucial in the team’s second success in three days. Sam Bennett (Bora-Hansgrohe) was the first to launch the sprint, but Gaviria remained patient after Max clipped off the front and it was only with 150 meters remaining that he opted to go and put his fast legs to work, taking a clear victory by more than a bike’s length in front of his family and friends from Colombia. Today, the team was once again incredible. It’s an unbelievable feeling to have such a team around me, and I feel lucky and grateful for this. Qm Antifriction cream +, go for a ride without any pain. “The finish was pretty hectic, but I was calm at all times, thanks to the excellent job of the guys. Davide pulled hard at the front to bring us in a good position, then Max was outstanding in guiding me through the closing meters. I’m happy with my two victories and with the way I feel. This win is not only for me, but also for my family and team, who have always supported me”, said Fernando Gaviria, who now holds a commanding lead in the points classification.